There was this, which I knew was coming but was a thrill to see all the same. It’s the Davitt Award I blogged about last week. It is on the large side and I have no idea where to put it, but perhaps I can clear a space for it on the Bookshelf of Narcissism. I’m sure the duck won’t mind shoving over a little. Then there was this, which I had no idea was coming, and was therefore a different kind of thrill. It’s a letter from Simon Crean, congratulating me on Surface Tension having been judged a ‘highly commended work’ in the Prime Minister’s Literary Awards. What a lovely note to receive out of the clear blue sky. I had no idea such a category even existed. In excellent news, this letter is quite small and foldable, making it relatively easy to slip in between volumes on the Bookshelf of Narcissism. The duck is bound to be pleased. 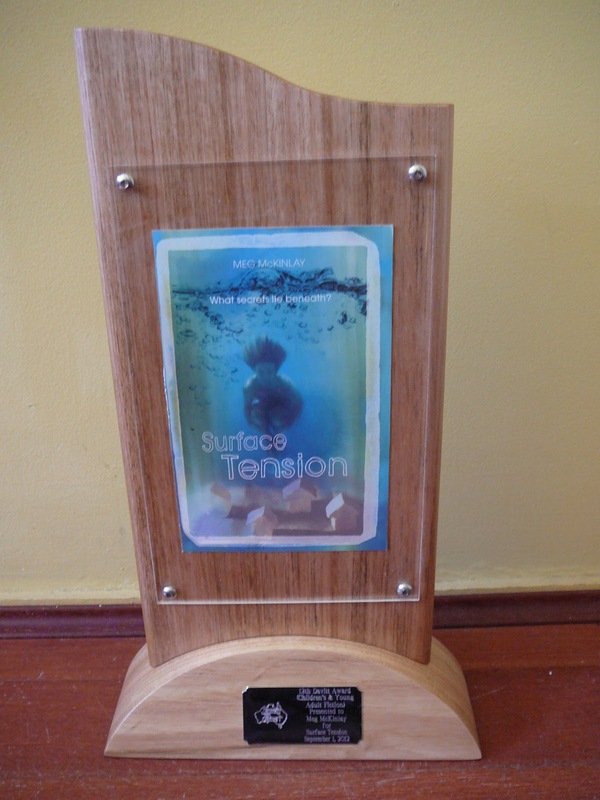 This entry was posted in Awards, Surface Tension on September 12, 2012 by Meg McKinlay. Thrill a minute, Meg. So pleased to hear that the shelf of Narcissism is filling up so rapidly!